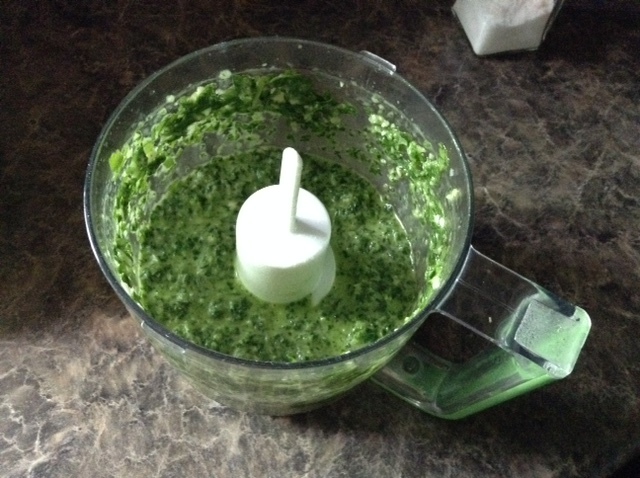 I make pesto a variety of ways, but this simple cilantro parsley pesto my go-to version. It’s simple, quick, totally vegan, and more affordable than the traditional pesto. Traditionally, pesto is made with basil and pinenuts, but can be made with any green and any nut. I usually add a chile for spice, because everything is better with a touch of heat, but up to you, works fine without it if you prefer. I make it with a bit less oil then normal, so its sort of a pesto base. You can add more oil when adding it to a pasta sauce, or use it as is, spread on a baguette for some really awesome garlic bread. Try it in this Veggie Sandwich!